Celebrating upcoming nuptials is an age-old tradition, typically involving an all-girls bridal shower. 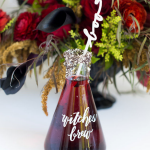 However, as men have become more involved with the events surrounding the wedding, more and more women are letting the men in on the traditional “girls only” bridal shower and instead having a co-ed wedding shower. Although we aren’t sure if co-ed wedding showers are here to stay, they have continued to gain steady popularity over the past few years. Since a lot has changed over the years, we’ve got answers to the questions everyone’s asking about this latest trend and some awesome tips for hosting and attending his and hers wedding showers in style. So, is a co-ed wedding shower similar to the traditional ever so girly bridal shower? No way! Couple wedding showers are more like cocktail or dinner parties (or cookouts – if you’re going really casual). That’s right; it can be as simple as firing up the grill and having a low-key celebration. A co-ed shower can be hosted by the maid of honor, best man, entire bridal party, or the couple’s friends and/or extended family. Female and male relatives, as well as the wedding party and close friends should be invited. It’s still a “shower” so everyone will bring a gift. Therefore, you don’t want to invite anyone that is not already on the wedding guest list. We recommend once you have a guest list in order that you send out invitations with plenty of notice prior to the event – at least four to six weeks. You can find a large selection of invitations for his & hers wedding showers over at Wedding Paper Divas. What should the theme be? Or, do you really need a theme? Pick a theme that matches the couple’s personality. Stock the Bar Co-ed Soiree – Simply ask guests to bring two bottles of their favorite wine or spirit– one to stock the couple’s new bar as a married couple, and one to open and try at the party. 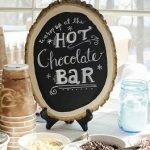 Check out more over at myhoteolwedding.com. “I do” BBQ – A BBQ is perfect for a casual couple. Check out this adorable invitation pack from Angelina Works on Etsy. If you don’t want to have a “themed” party, go neutral with the color palette for the event. You don’t have to have a theme, to have a great party. What types of games & activities are appropriate? Again, this isn’t the traditional bridal shower, make sure if you’re going to have games at the event that you make them interactive and gender neutral. For an active young couple, you can have a friendly tournament of guys versus girls volleyball or softball. Or go more traditional – etsy.com has a great selection of games you can order like “Guess Who” or “He Said or She Said” customized to fit the couple. How much food and drinks do I need? Everyone always wonders how much food and drinks they should prepare for a party. We love this guide from Chickabug on how much to serve at a party. The easiest way to guarantee that the to-be bride and groom get exactly what they want is to include the registry information on the invitations. We find it’s even easier to list RegsitryFinder.com if the couple is registered in multiple locations. We hope that we’ve answered all your questions about hosting a co-ed wedding shower and that you now have all the inspiration you need to throw a great party! If you have any additional questions, please stop by the Ask Cheryl page and submit your question. 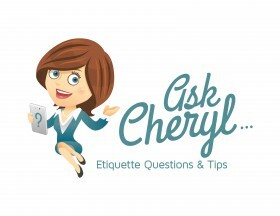 We will email a response to you and your question may appear in on the Ask Cheryl Etiquette Blog of the RegistryFinder.com website.